Mixmax Polls make it easy to get quick, direct, and structured replies from your recipients, thus increasing your response rates. When a recipient answers your survey or poll, you receive the response immediately via an email notification. Some polls are also summarized in the Polls page of the Mixmax web app. This overview will go over three types which can be found in the Enhance menu when composing an email. The Group Event Poll is explained in detail here: Group Event Poll. 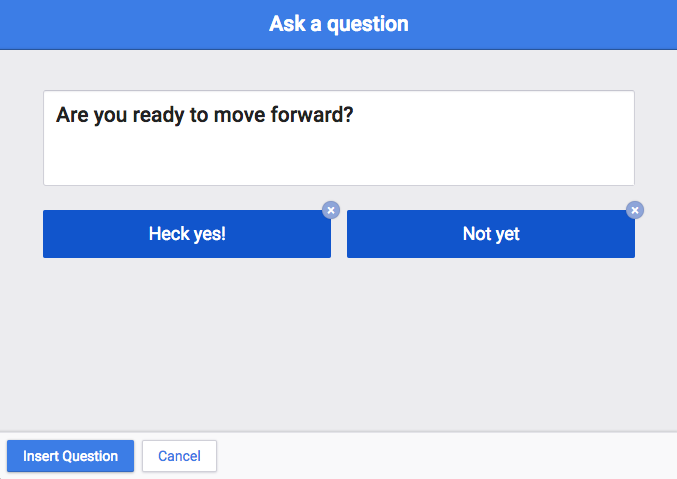 The Yes/No Question is great for getting a quick answer on a straightforward question. Add a Yes/No question to your email using the /yn slash command. To make things more efficient, you can also add your question after the slash command to insert it instantly into your email. You can also select Yes/No from the Enhance menu found when hovering over the Mixmax coin at the bottom of the compose window. Type your question in the window that pops up. You can customize the answer choice text for your recipient(s). Just click the text - it'll be highlighted and you can start typing your customized text. To remove an answer choice entirely, click the " X" in the top right corner of the answer choice. Click Insert Question when you're done. 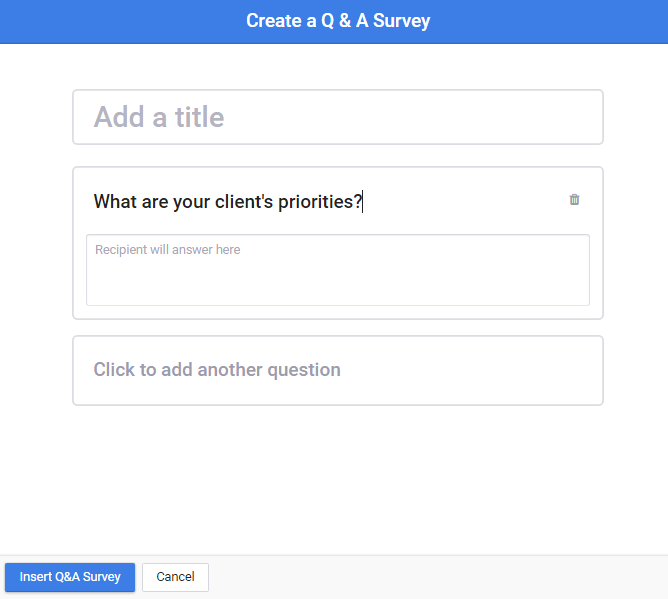 Q&A Surveys help you ask focused questions and make it easy for recipients to respond specifically to each of your questions using free-form text. They’re great for customer support, dealing with suppliers, or just getting straight answers. The Q&A survey can be accessed with the /qa slash command. To make things more efficient, you can also add your question after the slash command to insert it instantly into your email. You can also select Q&A Survey from the Enhance menu. Type your question in the resulting window. You can choose to add a title or additional questions from there. Click Insert Q&A Survey when you are done. Polls enable you to ask a question and have the recipients chose one option among several. They’re great for quick answers to simple questions, because your recipients don’t need to write a reply. They just click a button, and their response is sent directly back to you in an email notification. The Q&A survey can be accessed with the /poll slash command. In this case, the slash command will open the window to construct your poll — same as clicking on Poll in the Enhance menu. 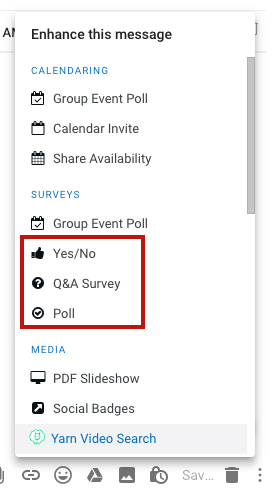 You can have as many options as you want (keep in mind how it will appear in the email), and you can choose whether or not you want your recipients to be able to view the results of the poll. Just click Insert Poll when you are done. When your recipients respond to a poll, yes/no question, or Q&A survey, you'll receive a separate email notification with each recipient's answer. You can also get polls results directly from our API. 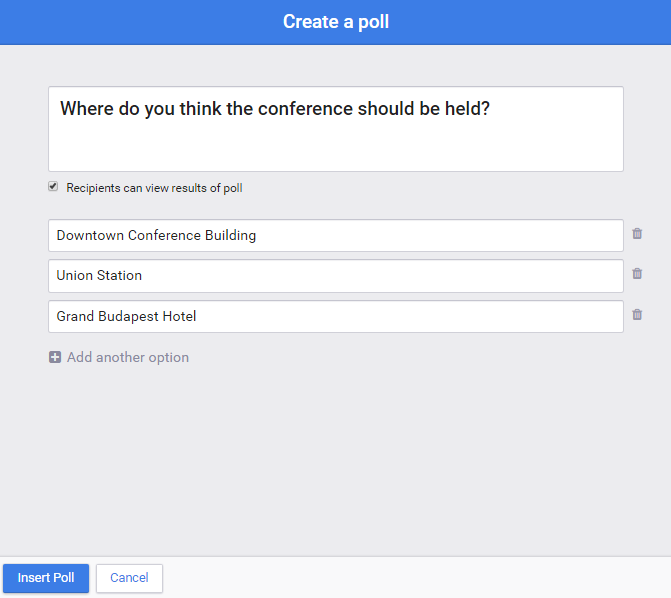 If you're a Growth or Enterprise user, you can get poll results compiled directly in Google Drive. Steps on how to set this up can be found here: Poll Results. Note: if you have a poll in a sequence, responses to that poll will count as a reply. More on that here: What counts as a sequence reply?